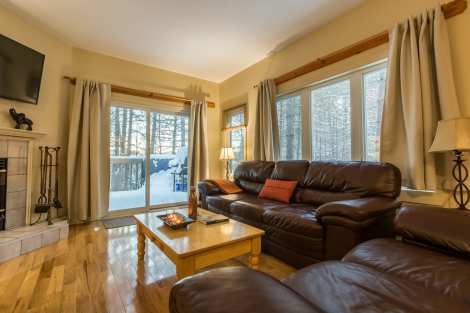 Champetre Condos for Rent in Mont Tremblant. Save Today! Champêtre condos are a well-kept secret in Mont-Tremblant and offer unbeatable price-quality value. 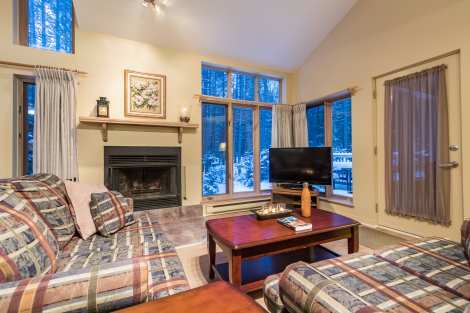 Nestled in the forest, in a quiet, peaceful setting, these condos are only a few minutes' drive from the well-known Tremblant Resort Village, the town and Domaine St-Bernard. With its quick, easy access to several golf courses, activities, and snow and water sport facilities, it's the perfect spot for a hassle-free holiday. A roomy, bright and welcoming condo you will look forward to spending time in. The unit is maintained with care and rooms are well laid out to offer pleasant living spaces. We love everything about it: how the kitchen opens onto the dining room, the cathedral ceiling, the wood-burning fireplace, the screened-in porch and the luxurious master bedroom. Equipment includes high-speed internet access and an HD TV with cable. The large balcony overlooking the forest is equipped with a table and barbecue in summer. 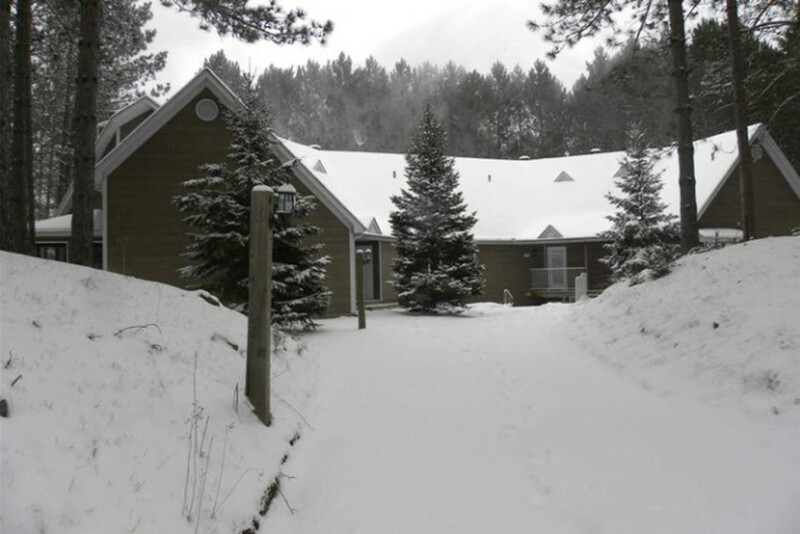 This cozy but spacious property is the very essence of relaxation, with its wood fireplace and natural surroundings, the bright and comfortable living space and forest views. We like the wood floors, two private bathrooms and large balcony for summer. The well-equipped kitchen will make you feel like staying in to cook with friends and family. And if you need anything, a few minutes' drive takes you to the town's shops and grocery stores. Wireless access to high-speed internet, an HD TV with cable and a DVD player are also provided if you want to stay connected. 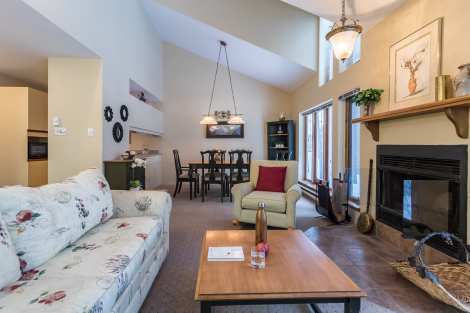 This charming condo with country-style flair is walking distance from Ouimet Lake. This newly renovated property is sure to please with its wood-burning fireplace, large kitchen fit for a chef, wood floors and two spacious bedrooms each with a private bathroom. We love how the four glass doors create space and light and offer a great view. Equipment includes wireless access to high-speed internet, cable TV and a DVD player. From the moment you arrive, the forest and charming landscaping will make you feel far away from the hustle and bustle of the city. And yet, you're still close to everything! This condo with country-style charm has two bedrooms and three bathrooms. Built over two storeys, it offers a generous amount of space, featuring a cathedral ceiling, large balcony and screened-in porch. In the well-equipped kitchen, you have the space needed to prepare gourmet meals. The dining room is bright thanks to glass doors that look out onto the forest. The living room's large windows and wood-burning fireplace make it a luminous but warm room. Bedrooms are conducive to relaxation. Everything is in place to ensure a very enjoyable stay. 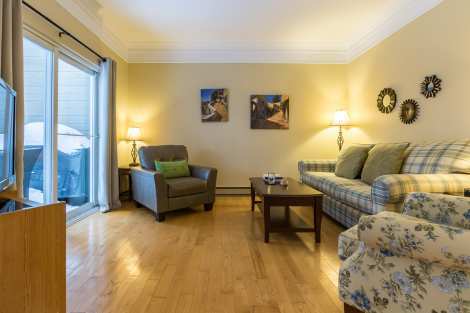 Large two-storey unit with three big bedrooms, each with a private bathroom. It's the perfect spot for a hassle-free holiday that keeps vacationers happy. 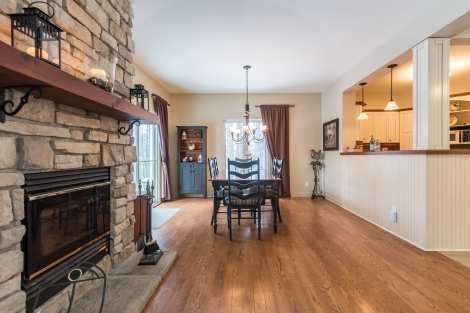 We love the common living area, the open living room with wood-burning fireplace and large windows, the discrete but very functional kitchen, and the peace and quiet. The unit comes equipped with wireless access to high-speed internet, an HD TV and a Blu-Ray player. Summer or winter, the charming interior will make you feel like you've made the right choice for your accommodations from the moment you step inside.